Richard Sealy, director of The Rehab Practice, a private neuro-therapy rehabilitation program in the United Kingdom, regularly works with individuals, families, and caregivers to establish custom exercise routines to aid in recovery from from long-term neurological problems, like the damage caused by stroke. While he acknowledges that each patient should have a custom exercise routine specific and personal to their struggles, he recommends a series of exercises to help strengthen the legs and improve range of motion during stroke recovery. Sealy understands the importance of fast progress after a stroke, and including ongoing at-home exercises can improve health and well-being. 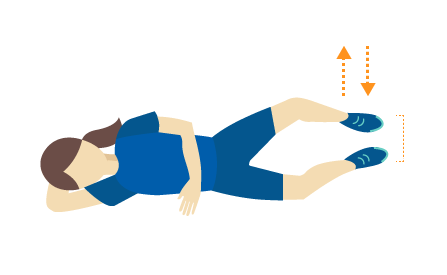 These low-impact strength and stretching leg exercises for stroke recovery are a good complement to use in conjunction with the Saebo MyoTrac Infiniti biofeedback system. As with any exercise program, please consult your healthcare provider before you begin. If you notice increased pain, discomfort, or other troubling systems, stop these exercises immediately and talk to your doctor. difficult. In addition, weakness can occur around the muscles on the exterior of the hip area. Exercises for standing and balance are vital to helping you regain your quality of life after a stroke. 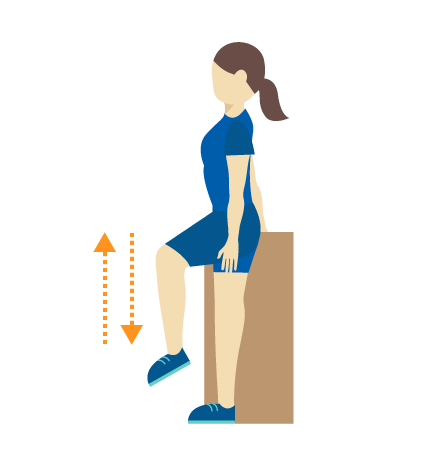 When performing these exercises, always hold onto a table or similar stable surface to avoid a fall. Hold on to a stable surface, standing straight and tall while you transfer your weight to one side. Swing the other leg to the side. Use your balance to hold this position for 10 seconds. Slowly lower your leg back down. Repeat a few times, as long as you have the strength, and then switch legs. Once you have mastered the first exercise, move on to the intermediate level. Again, hold on to a stable surface, keeping your back tall and straight. Transfer your weight to one leg, and bring the other leg up in front of you, bending the knee. Hold this position for a count of 10, and slowly lower it back down. Repeat, then switch legs. Finally, progress to the advanced level. This time, stand straight and tall and transfer your weight to one leg. Swing the other leg out behind you as far as you can. Hold for 10 seconds, if you can, and lower it back down slowly. Repeat and switch legs. This progression of exercises will strengthen the hip muscle and improve balance, so you can regain normal use of your legs. This exercise series pairs well with the Saebo MayoTrac Infiniti biofeedback triggered stimulation system. Often after a stroke, the hips and the core muscle groups, which are crucial to standing and walking, become weak. Bridging exercises help to strengthen these core muscles. Like the standing and balance exercises, bridging exercises move through a progression to help rebuild your strength and coordination. The basic bridging exercise, called “Inner Range Quad Movement”, builds strength in the thigh muscles. 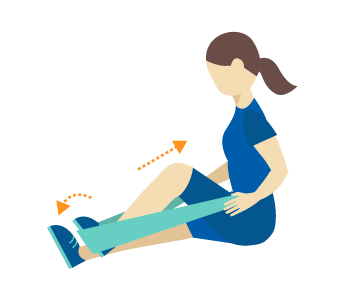 To perform this exercise, lay down and place a pillow or rolled towel under the knee joint. 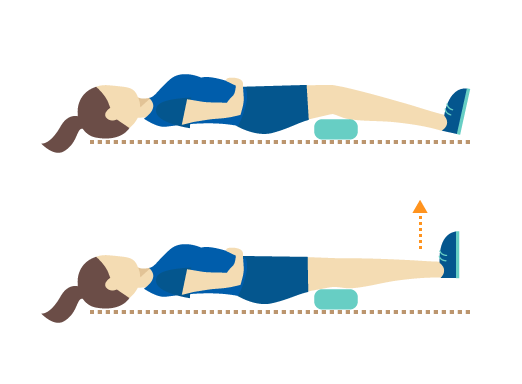 Then, press the back of the knee into the pillow or rolled towel to lift your heel off the floor. “Ski Squats” take bridging exercises to the next level. 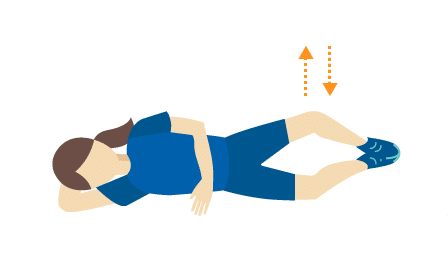 For this exercise, lean against a flat wall, placing your feet in front of you. 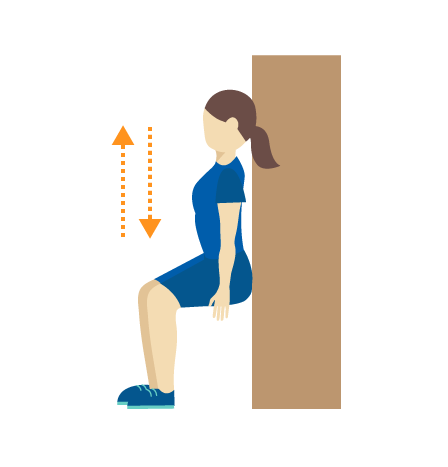 Using the wall to support your weight and your back, slowly bend your knees to lower yourself down. Hold this position for 10 seconds, if you can. Slide back up, supporting your weight on the wall, until you are in a standing position. 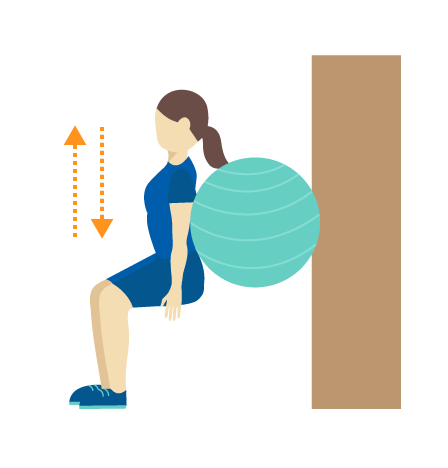 To take bridging exercises to the advanced level, repeat the “Ski Squat”, but place a gym ball between yourself and the wall when you bend your knees into the squat position. If the lower legs are affected after a stroke, Clams can provide strengthening and improved range of motion. Clams focuses on building strength and coordination in the lower leg, increasing range of motion and control. Before starting Clams, you must stretch the calf muscle and build coordination in the lower body. In Sitting helps with this. In a sitting position, create a stirrup around one foot using a towel or belt, placing the stirrup around the ball of the foot. 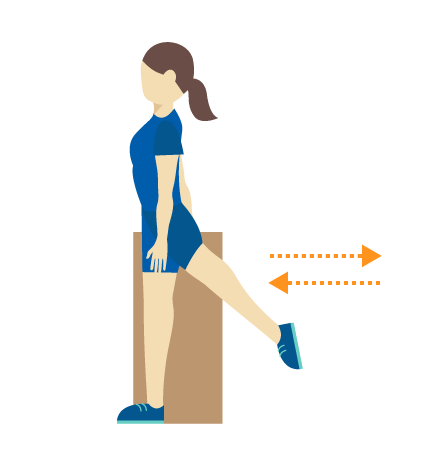 Gently pull the stirrup up towards your body to stretch the calf muscle. Then, pull it with the outer hand to turn the foot out, continuing to stretch the muscle. Once you have build some flexibility, you are ready for the Clams exercise. Lay down on your side, and bend your knees, resting one on top of the other. Then, while you keep your feet together, lift the upper knee away from the other knee, holding them apart for a count of 10 seconds. Slowly lower your knee back down. While performing this exercise, make sure that you do not roll your hips back. After mastering Clams, take it to the next level by lifting the knee and the foot of the upper leg. Again, hold the position for a count of 10 seconds. Lower it back down. Repeat a few times to build strength and range of motion. Strokes can occur in people of any age, although nearly 75% of all strokes occur after the age of 65, and an individual’s risk doubles after 55. Each year, approximately 600,000 people suffer from their first stroke, and an additional 185,000 have a recurrent stroke. If you have suffered one or more strokes, it can be easy to feel discouraged at the lack of mobility and control you experience. Stroke exercises, like these, can help you regain that control and build up your strength again, so you can recover from the neurological damage of a stroke. For extra support in advancing your recovery after a stroke, check out the many advanced products from Saebo to help you every step of the way.